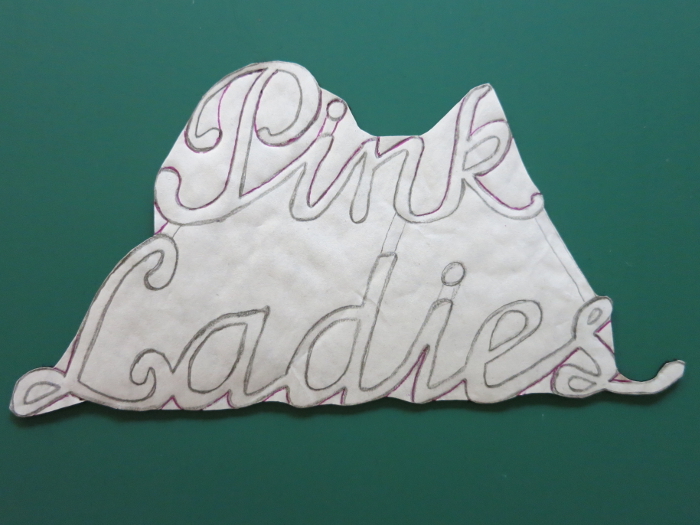 Cutting out detailed designs from felt is not easy. But with a few simple tricks, this daunting task becomes quite doable. 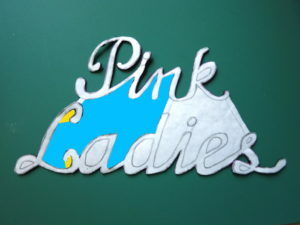 I made the Grease-inspired Pink Ladies applique shown above by cutting out the black letters from felt. 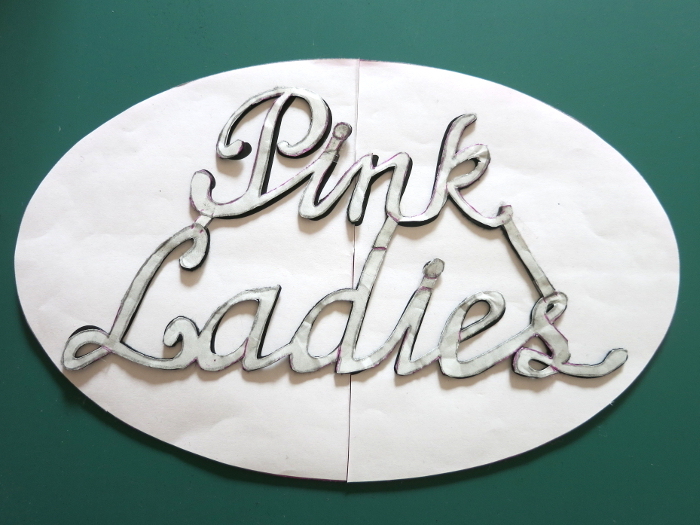 These instructions describe the process I used, and the same tricks can be used to cut out any design from felt. 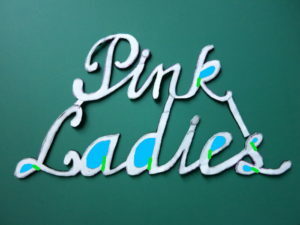 If you like the Pink Ladies applique that I made, you can download the template from this link: Pink_Ladies-Muumade-Free-Template. 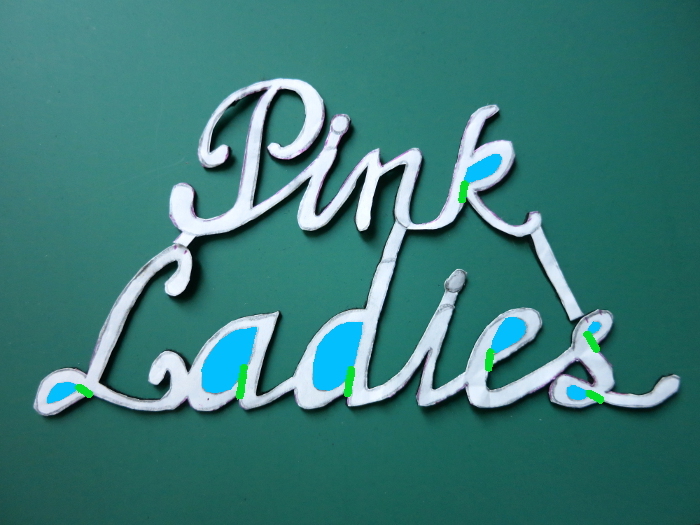 (Note: I ask that this file be used only for personal projects). Or, here is a link for another free Pink Ladies template. 1. 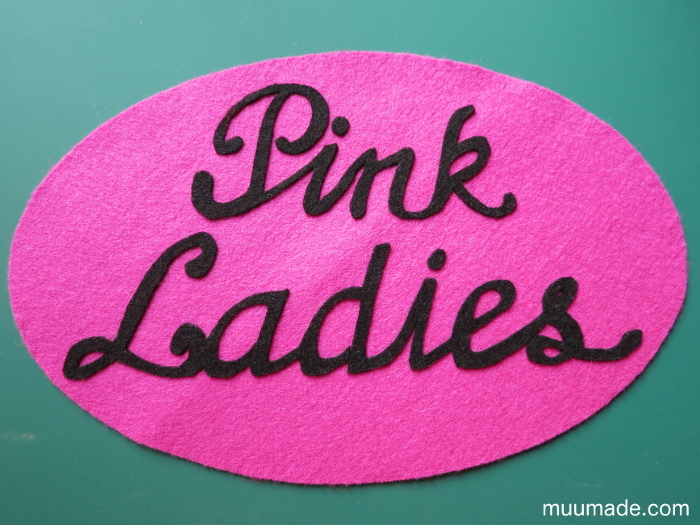 Print out the pattern that you wish to cut out from felt. Place a piece of freezer paper on top of the pattern, rough side up, and trace the pattern onto the freezer paper with a pencil. 2. 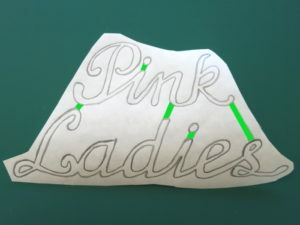 Draw in sections on the freezer paper to temporarily connect the disconnected parts of the pattern (as highlighted in green in the photo). Cut the freezer paper around the pattern, leaving a 1 cm (3/8″) margin. 3. 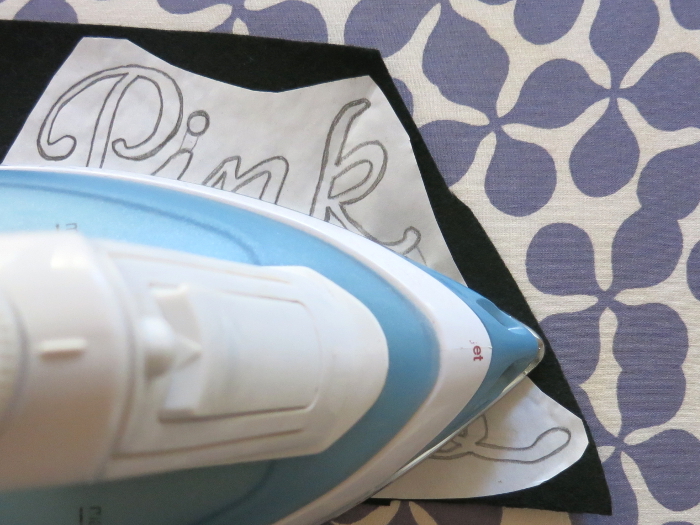 Place the freezer paper on top of the felt from which you wish to cut out the pattern. 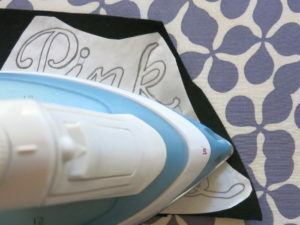 Firmly press an iron (on medium heat) onto the freezer paper for 15 seconds or so. 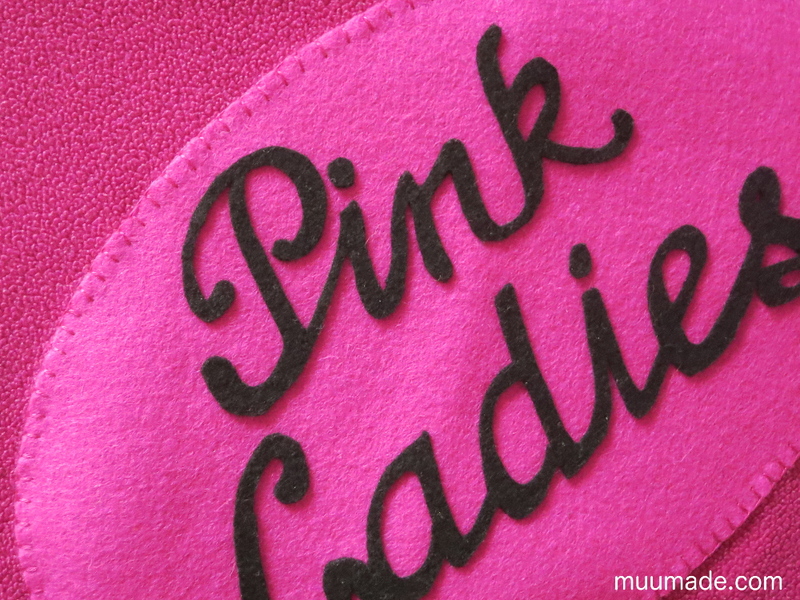 If the pattern is large, repeat until the entire pattern is attached to the felt. 4. 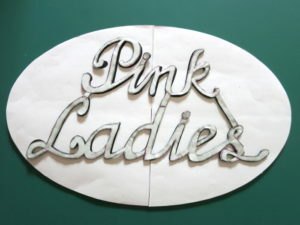 Roughly cut out the outline of the pattern, leaving complicated areas uncut. 5. 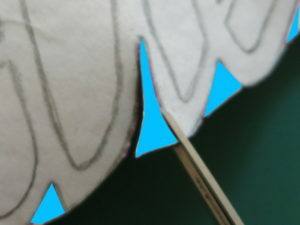 Now cut out the indentations around the edge of the pattern, like for example the parts of the photo highlighted in blue. I recommend cutting from one side of each indentation until reaching the deepest part and then starting again to cut from the other side. 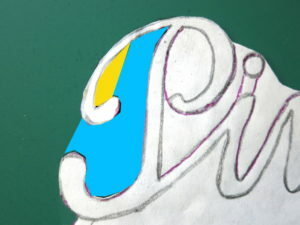 For more intricate areas, such as the “P”, refer to the next step. 6. 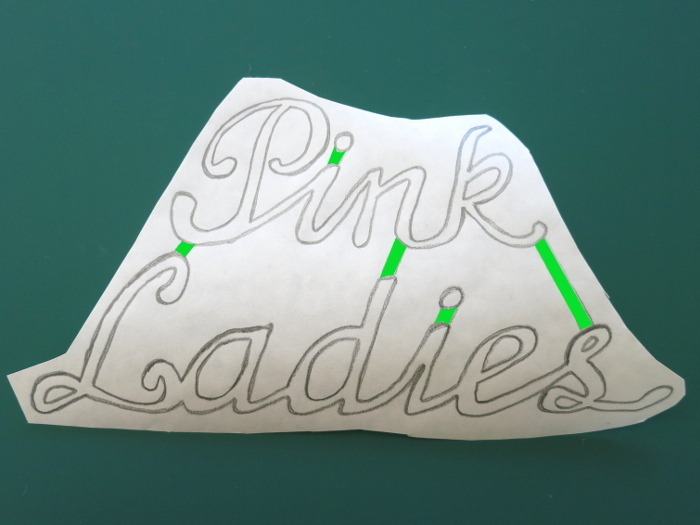 Some of the most complicated parts of the outline of the pattern will require multiple steps to cut them out. Continue until you have cut out the entire outline of the pattern. 7. It is now time to cut out the large inner sections of your design. Start by making a small cut in one of the inner sections, such as the area highlighted in blue. When done cutting out the blue area, you can then cut out the detailed areas highlighted in yellow. 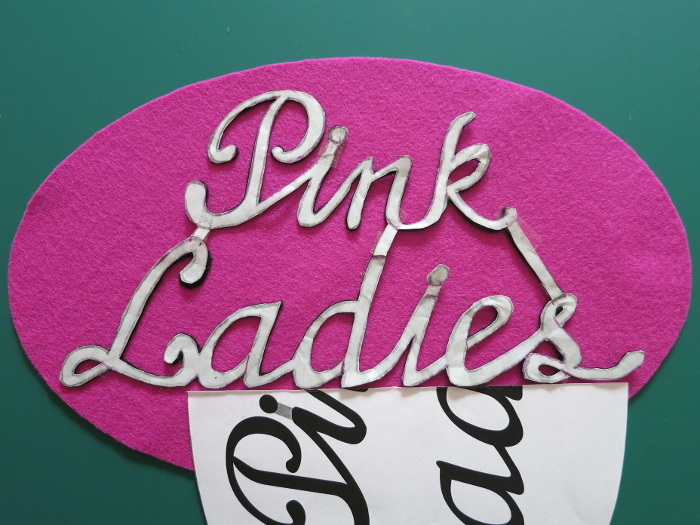 Continue until you have cut out all of the large inner sections of your pattern. 8. Lastly, cut out the small inner sections. In this example, I was able to cut out all of those areas by cutting into them from one edge, as shown by the green lines in the photo. 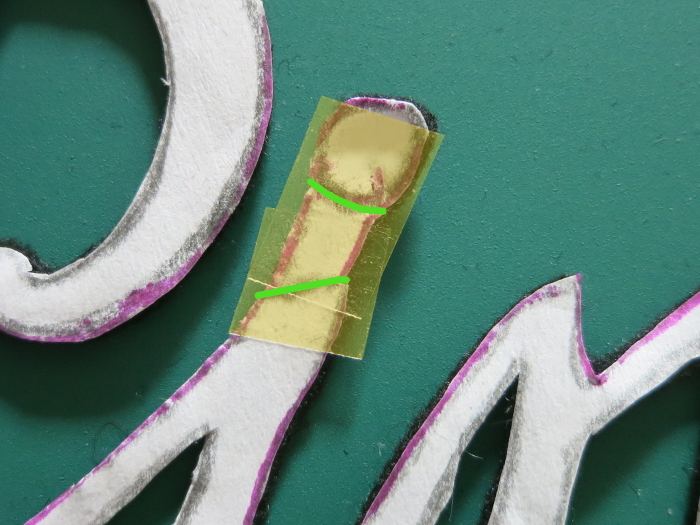 If you now have sections of your design which need to be held in place, such as the green lines in the photo, use tape to hold them together. Now you have almost completely cut out the pattern. 9. Place tape over the ends of all of the temporary connectors that you made in Step 2. Cut out the connectors (along the green lines in the photo), remove the felt from the freezer paper, and then re-tape the freezer paper back into place using the edges of the tape as a guide. The goal here is to cut out the entire pattern from the felt while at the same time holding the disconnected pieces together! 10. Cut the template in half. 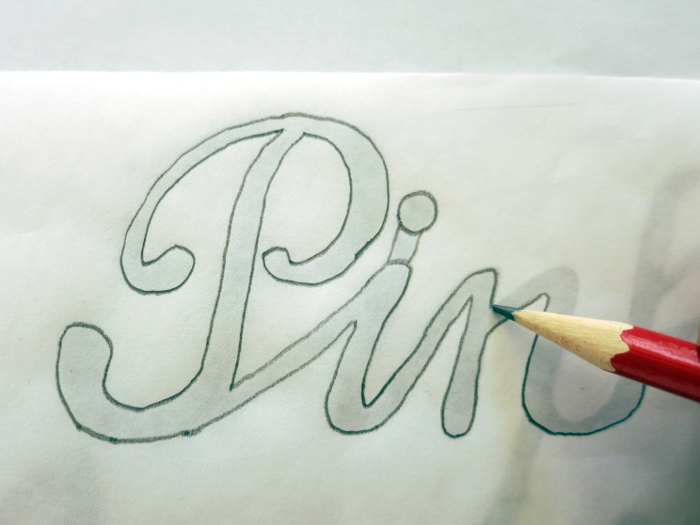 Place both halves of the template on top of the surface where you want to attach the pattern. 11. Carefully align the felt pattern on top of the paper template. 12. 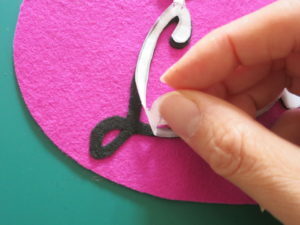 While holding the felt pattern in place, carefully remove one half of the paper template. 13. 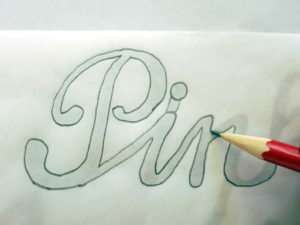 If your design has letters, place a straight edge along the bottom of the letters, as shown in the photo. 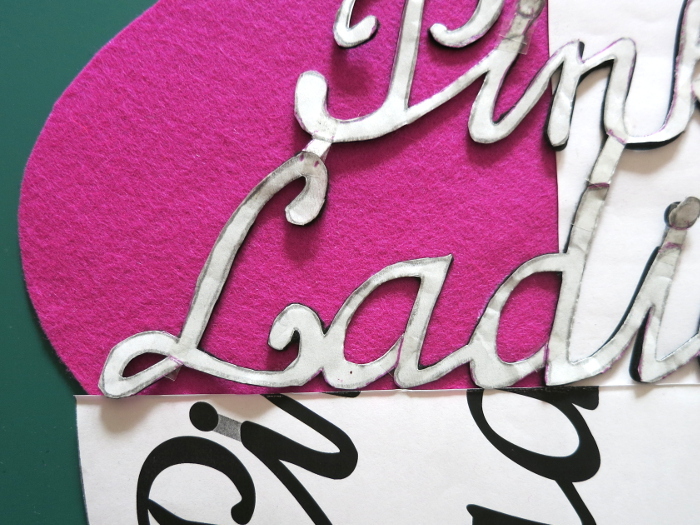 This will help to maintain the base line of the text while gluing the letters in place. 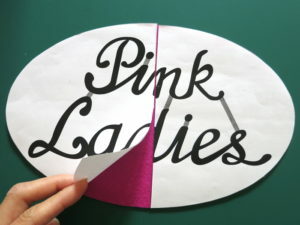 Working only on the side of the pattern without the template, apply glue to the back of your pattern. Start from the center and work your way to the edge. 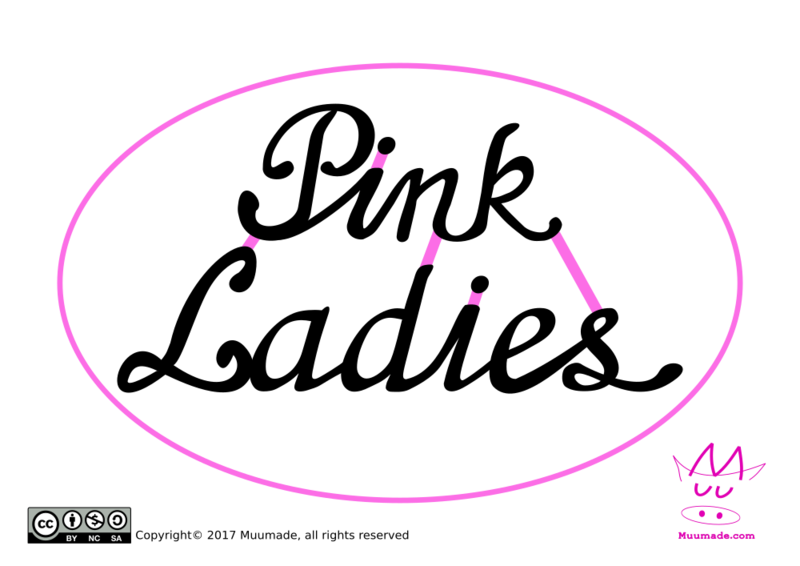 In this case, I started with the “d”, then moved on to the “a” and finished with the “L”. 14. Once the first half of the template is glued, carefully remove the second half of the paper template and glue the rest of the pattern in a similar manner. 15. After letting the glue dry, carefully remove the freezer paper from the felt. Congratulations! 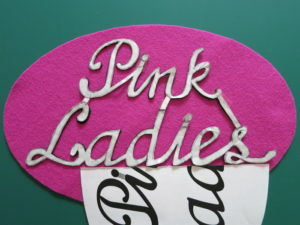 You now have an impressive looking felt applique. 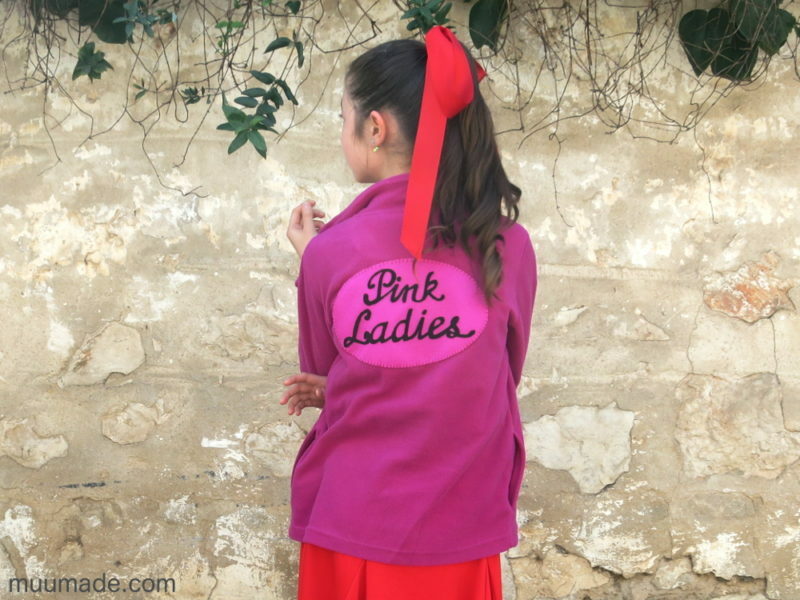 As shown above, I used the Whip Stitch to sew the applique onto a jacket (so that I could remove it later). However, if you wish to permanently attach the pattern, you can glue it onto the garment.